The Finite Element Method (FEM) has become an indispensable technology for the modelling and simulation of engineering systems. Written for engineers and students alike, the aim of the book is to provide the necessary theories and techniques of the FEM for readers to be able to use a commercial FEM package to solve primarily linear problems in mechanical and civil engineering with the main focus on structural mechanics and heat transfer. Civil, Mechanical, Structural, Aeronautical, Automotive and Marine engineers all benefit from the techniques outlined. The number of engineers working in industries that would require this modeling and simulation of engineering systems is well over half a million. 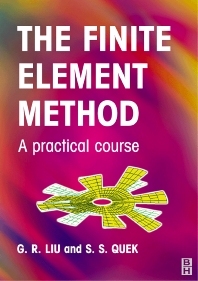 Preface; Computational modelling; Introduction to mechanics for solids and structures; The Finite Element Method; FEM for trusses; FEM for beams; FEM for frames; FEM for two-dimensional solids; FEM for plates and shells; FEM for 3D solids; Special purpose elements; Modelling techniques; FEM for heat transfer problems; Using ABAQUS; References; Index. Dr. Liu received his PhD from Tohoku University, Japan in 1991. He was a Postdoctoral Fellow at Northwestern University, U.S.A. He is currently the Director of the Centre for Advanced Computations in Engineering Science (ACES), National University of Singapore. He is also an Associate Professor atthe Department of Mechanical Engineering, National University of Singapore. He authored more than 200 technical publications including two books and 130 international journal papers. He is the recipient of the Outstanding University ResearchersAwards (1998), for his development of the Strip Element Method. He is also a recipient of the Defence Technology Prize (National award, 1999) for his contribution to development of underwater shock technology at Singapore. He won the Silver Award at CrayQuest 2000 (Nation wide competition in 2000) (Nationwide competition in 2000) for his development of meshless methods. His research interests include Computational Mechanics, Element Free Methods, Nano-scale Computation, Vibration and Wave Propagation in Composites, Mechanics of Composites and Smart Materials, Inverse Problems and Numerical Analysis. Mr. Quek received his B. Eng. (Hon.) in mechanical engineering from the National University of Singapore in 1999. He did an industrial attachment in the then aeronautics laboratory of DSO National Laboratories, Singapore, gaining much experience in using the finite element method in areas of structural dynamics. He also did research in the areas of wave propagation and infinite domains using the finite element method. In the course of his research, Mr Quek had gained tremendous experience in the applications of the finite element method, especially in using commercially available software like Abaqus. Currently, he is doing research in the field of numerical simulation of quantum dot nanostructures, which will lead to a dissertation for his doctorate degree. To date, he had authored two international journal papers. His research interests include Computational Mechanics, Nano-scale Computation, Vibration and Wave Propagation in Structures and Numerical Analysis.